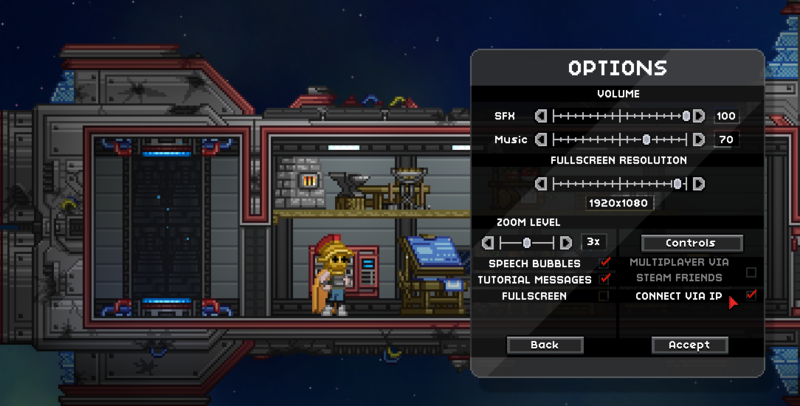 Since Starbound’s launch in Early Access, everyone’s been asking us to implement an easier way to play Starbound with their friends. A huge portion of our emails are from people sort of mystified by the process of forwarding their ports and inviting people to join via their IP (for those reading this who are still mystified, there’s a guide on our wiki!). In version 1.0, you will finally be able to join multiplayer Starbound servers via your Steam friends list. Hooray! You’ll be able to choose whether or not your Steam friends can join your game via a check box in your Options menu. You can also choose whether to allow people to connect via your IP! In this screenshot, ‘Multiplayer via Steam Friends’ is grayed out because I’m playing a dev build, but this feature should already work in the Nightly build. All of the usual caveats about Nightly apply.